This is the personal topic for Zhangshe Cranewind! It is here that they may post any of their course-related material, including contributions to their field! Submitted to Department Chair for discussion and approval. Additional copy submitted to Office of the Dean. This document is submitted as an opening point for discussion within the department and with the faculty as a whole. There is certainly the opportunity for alternative suggestions. I am not aware of the standard for how many courses per semester a faculty member offers. The same goes for customary arrangement of course sequences. Therefore I will be content with either a reduction of what should be offered initially, or with shifting specific courses between the proposed present & future topics lists. Once one or more specific offerings are approved for current presentation a detailed syllabus for each will be prepared and submitted. Written Pandaren takes the form of pictograms and more abstract ideograms. As such no knowledge of spoken Pandaren is necessary. Because some Pandaren cultural concepts and perspectives are quite different from other peoples' studying written Pandaren can in fact serve as an effective gateway to learning to speak the language. Course format: 1/3 pattern. A lecture or group discussion followed by 3 sessions of individual assignments and in-office tutorial, with the cycle repeated throughout the semester. The course would cover an overview of historical development, the meanings of a basic set of signs, interpretation of commonly occurring signage and labels, and other topics related to encounters a visitor to Pandaren locations might encounter in day to day activities. The course would culminate in a final project: composing a letter, posting it, and interpreting the reply. The course would cover organically built (as opposed to professionally designed) structures. Special emphasis would be placed on homes as embodiments of social networks and cultural values. Regional variations would be explored at the level of practical necessities for daily activities and also in terms of habitus (socio-cultural strictures on individual behavior). Student's understanding of homes would then be expanded into analysing other structures such as inns and market places. The last part of the course would look at villages as a built environment and as a basic social unit within Pandaren culture as a whole. Students in small groups would develop a design for a community in a Pandaren region of their choice over the course of the semester. A substantial portion of course evaluation would be based on the group's creation of a three-dimensional model and presentation to the class of their design. Sodalities as loci of social influence. Academic supervision by Visiting Prof. Cranewind for those pursuing Pandaren Studies as a concentration, and consultation as requested by other faculty for students in other fields of inquiry. Practical arrangement by Visiting Prof. Cranewind through local contacts for placement, housing, etc. Course registration not required to attend. For faculty, students, adjuncts and invited friends of the university. While distinct from the Colloquium series if desired any of these topics could be offered as such. Many other topics could be presented about the rich and varied Pandaren culture of course, depending on the interests of the faculty. Informal yet in-depth discussions with other faculty. I am seeking both advice/support for my own studies and to function as a consultant to those in other fields with overlapping interests. More formal potential outcomes could include guest lectures, co-authorships, and joint presentations or panels at conferences. Much more tenuous than the proposals above. Consider these as brainstorming seeds for Informal discussion. Demonstrations of Pandaren sports, martial arts, etc. Students would receive course credit through assignments approved by and submitted to professors whose courses they are enrolled in. Examples may include but are not limited to: papers, posters, class presentations, creations in various media, and so on. Peer-reviewed. Open to submissions from all disciplines. Hopefully we can come up with a name that is more reflective of the playfulness and poetry of Pandaren. 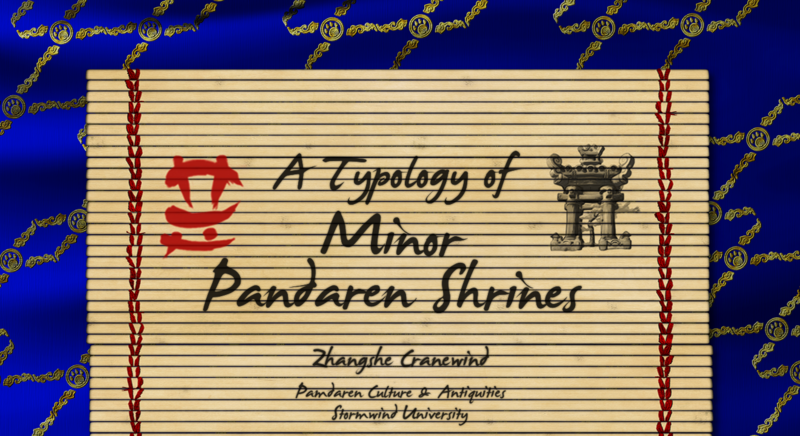 Design of a course sequence sufficient to meet University degree requirements for Pandaren Antiquities and Culture as an area of concentration - not as a specific major until a later stage of development. Most courses within the Pandaren studies concentration would be developed in such a way as to make them suitable as electives for students pursuing degrees in other disciplines. An additional requirement would be completion of at least one Independent Study or Fieldwork assignment within the field of Pandaren studies broadly construed. I look forward to discussing these proposals both formally and informally, with you and with my colleagues on the faculty as well. OOC: Everybody feel free to comment either IC or OOC. I definitely want this portfolio to be an extension of the great collegial interaction we're already developing in-game. Being able to re-read will be a lot easier than trying to remember in detail what was said in-game. 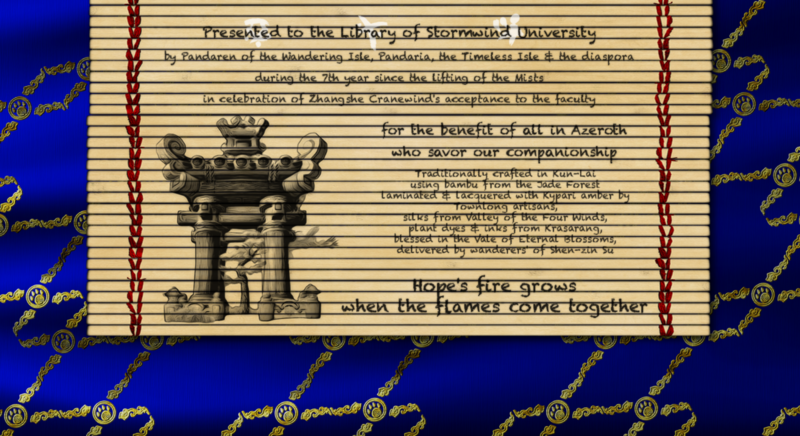 IC: Pandaren you know & many you don't got together & had a special scroll made of a text by Zhangshe as a community contribution to the University library. OOC: The link should be publicly accessible for you to dl the whole scroll (18 images, larger than these previews) as a pdf without needing a dropbox account. If you have trouble let me know. Special thanks to Yao of Jadepaw Dynasty who several years ago made some random Pandaren ideograms that work well with the few Blizzard posted then later gave me permission to assign meanings and use them in my art. In addition to the Dean's response, comments by my colleges are encouraged. OOC: Original images are larger. If you have trouble reading this you may want to click through to view full size.